Occupying slightly less than sixty miles at the edge of the continent, Alabama’s Gulf Coast is more varied than a first-time visitor might imagine. The beaches, less well-known than their Florida counterparts, are less populated with tourists and still look largely as nature intended. The tourists go there, to be sure—tourism is one of the state’s most important industries—but not in the kind of numbers that Florida sees. 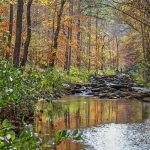 The result is a stretch of white shoreline dotted with colorful and historic towns in a part of the state that happens to be one of the most biodiverse regions in the United States. And with a culture influenced by French, Spanish, and English settlers as well as African slaves, Alabama’s Gulf Coast is a region not quite like any other. The largest city along the Gulf Coast of Alabama is Mobile, a port city located on the Mobile River and Mobile Bay. Founded by the French in 1702, the city’s look and feel is similar to that of New Orleans, but without the raucous elements and with a decidedly more family-friendly vibe. It was actually in Mobile that Mardi Gras began, and it’s still celebrated there, but Mobile’s festivities are definitely PG-rated compared those in New Orleans. In addition to its Mardi Gras celebrations, the city is famous for its springtime azaleas and its seafood, both of which can be found in abundance there. 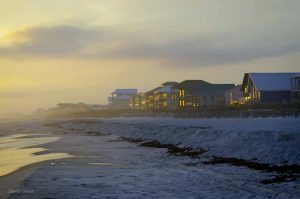 Gulf Shores is the major tourist destination along the Gulf Coast, and has the most options in terms of accommodations. It’s popular for a reason—the Gulf of Mexico is warm and usually calm here, making it an ideal place for a lazy day by the water. But there’s more to the area than the beach. Nearby Bon Secour National Wildlife Refuge offers a taste of what the region was like before development; sea turtles, egrets, and alligators outnumber tourists here. And every year in May, Gulf Shores is home to one of the nation’s most popular live music events, the Hangout Music Fest, which is held right on the beach. Tourism was slower to develop in nearby Orange Beach, a small town coast. Here, the main attraction is The Wharf—practically a small town in itself—that features a movie theater, plenty of bars and restaurants, a marina, and a beachfront Ferris wheel that offers spectacular views of the water. The Flora-Bama, a bar/entertainment venue/package store straddling the Florida-Alabama line, is a long-time favorite among locals and tourists alike. 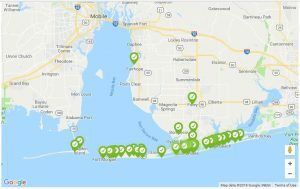 For those who really want to escape civilization, the sparsely populated Dauphin Island offers pristine beaches and plenty of opportunities to explore nature, both in and out of the water. The island is also home to one of the state’s leading marine research facilities. Across the bay on Eastern Shore are the cities of Fairhope, Daphne, and Spanish Fort. One of the state’s loveliest and quirkiest communities, Fairhope began in 1894 as a “model community.” Today, the city maintains the free spirit that guided its early years and is home to numerous art galleries, boutiques, and the Grand Hotel, a beloved resort that served as a hospital during the Civil War. In recent years, a number of production companies have chosen Fairhope for film locations, most notably for the movie Get Out. Daphne shares some of the laid-back, slightly eccentric qualities of Fairhope. In addition to a variety of shops and excellent restaurants, Daphne is home to “jubilees,” unusual events when masses of fish, shrimp, and crabs become trapped in the shallow waters at the coastline, making easy pickings for anyone hungry for seafood. 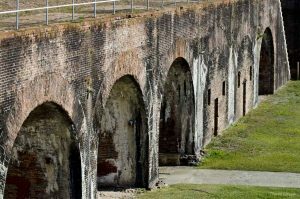 Spanish Fort, the smallest of the three cities, is home to Blakeley State Park, a Civil War battlefield, as well as the Alabama Oyster Trail. If you’re coming from farther away, the Gulf Coast is reachable from both Mobile Regional Airport and Pensacola International Airport. Numerous taxis and shuttle services operate from the region’s airports and between its cities and resort areas. For most people, summer is the ideal time to enjoy Alabama’s beaches. The beaches are typically their most beautiful in the warm months of summer. The water is warm and calm and it’s when many of the region’s festivals and outdoor events are scheduled. But it’s the peak season, meaning the crowds are larger and prices are higher. Spring is another popular time of year to head to the coast, especially if you prefer warm—but not hot—weather. The coast is a popular place for spring breakers, and it can become crowded in mid-late March through early April. The off-peak seasons of fall and winter can be surprisingly lovely at the coast. After Labor Day, the crowds gradually diminish, and it’s quite possible to have stretches of the beach to oneself in the cooler months. There is also the added perk of lower prices once summer ends. Alabama’s winters are mild at the coast, meaning that—aside from the occasional hurricane—there really is not bad time to visit. If you are ready to enjoy more and spend less on your next visit to beautiful Coastal Alabama, check out our website. We offer hundreds of beach houses and condos to fit every size and budget – book directly with Verified Owners and never pay booking fees or site commissions. 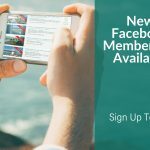 ALAVHR.com – The site you can trust!